Beer and sports often go hand in hand, but this recent photo shoot with Pete Webb took on a new twist. Aiming to show off Morvelo’s new line of winter biking apparel, Webb was challenged with working in the impressively small, but texture-rich environment of Dark Star Brewery’s walk-in cold room in Sussex. Other than the obvious appeal of working alongside an alluring lineup of draught beer, the cold temperatures allowed Webb to capture the drama of the cyclist’s steaming shoulders as he worked up a sweat on his stationary setup. The warm amber of the poured beers compared to the cold atmosphere leaves a lot to be appreciated beyond the Morvelo apparel. As Webb mentions in the behind-the-scenes video, this still shoot was motivated to compliment a previously shot video campaign. Morvelo cycle brand has developed a great content strategy along with myself and Alex Wykes from Verri Media. This strategy provides them with regular video and photo content to spread over a relatively short term before the next is developed and deployed. 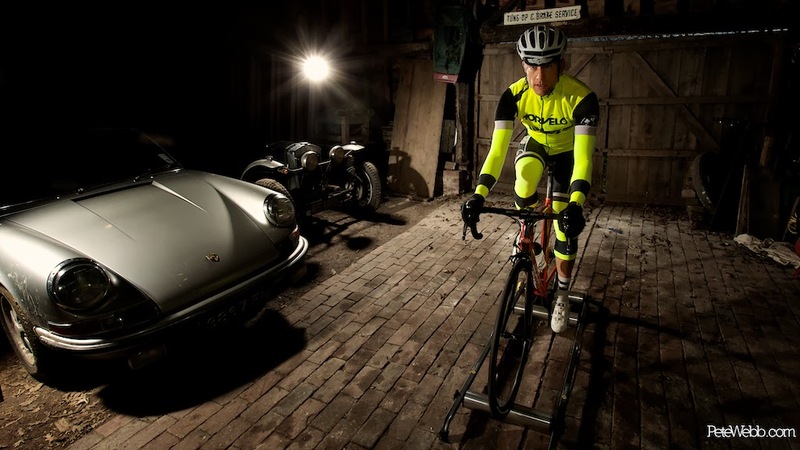 It seems that further questions about the location selection are answered by the creative development of those videos… particularly the second location of an old wooden barn, housing antique automobiles behind the featured cyclist. As a fan of creative sound design, I loved this concept. Again, the three light setup reminds us that we shouldn’t be intimidated by small spaces. Depth of the shooting space is often a great asset, but with a bit of creativity, even tight quarters can accommodate the tools needed to craft dramatic images. The key as ever is in the planning, and this allows us to shoot some great photo and video concepts in a short space of time. Often while we are on a Morvelo shoot we are getting the ideas together for the next one and the wheel rolls on. We’d love to hear from you and what your most challenging location has been. What spaces have pushed your boundaries or limited your use of gear in a challenging way? Let us know in the comments below! CREDITS: All photographs by Pete Webb are copyrighted and have been used with permission for SLR Lounge. Do not copy, modify or re-post this article or images without express permission from SLR Lounge and the artist.